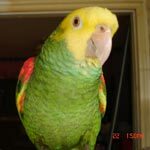 Parrot Forum • View topic - Photos of My Budgies!!! So, I found a way to post pictures of my boys! I'll provide the link to every one! Sorry, those are the only ones I have so far that I can post! I'll try to get more later! Thanks for stopping by! Re: Photos of My Budgies!!! They are adorable. I can see their intelligents in their eyes. Do they talk? I think it is a budgie that holds the world record in vocabulary. About 40 years ago my dad was dying of cancer. My two little budgies kept him company and entertained. They would even argue with him. I had them in a small cage and put them on the table beside my dad. (I knew nothing about birds back then). They would even throw things at him when they thought they were loosing the argument. I rescued 2 budgies and had them for about 6 months. I loved them. They were such happy little things. I did realize that I was not doing the best for them since I had the other two species. Wolf took them in when I had to give them up to someone who had more experience. I think Pajarita has them now. They look like twins! Adorable! But I noticed that Skittles is clipped on the first picture but it looks as if he was not on the picture where the two are together - or is that Nico? Liz, nope my birds don't talk. They are pretty smart, though! Pajarita, I see what you're talking about! The reason his wings are like that is because sometimes we allow them the fly freely in a room, but most of the time we clip them, but mainly for their safety. For example, one time Skittles was outside of the cage, his wings weren't clipped, and he flew and flew straight into a wall, and fell down. He didn't get any injuries, but he seemed a little confused after a bit. Anyways, so I took that picture when he had his wings grown. Also, Liz, I'm so sorry to hear about your father! Your birds sounded great, though! I see... well, I hope you do more research about clipping versus keeping them flighted because the 'it's for their safety' reason has been debunked. Clipping is never safe for them as it's the ONLY way nature gave them to avoid predators and danger plus not flying is very bad for their respiratory system AND their emotional wellbeing (they feel vulnerable and get anxiety from it). Birds only bang themselves against a wall when they are freaked out, otherwise, they never do. Pajarita wrote: I see... well, I hope you do more research about clipping versus keeping them flighted because the 'it's for their safety' reason has been debunked. Clipping is never safe for them as it's the ONLY way nature gave them to avoid predators and danger plus not flying is very bad for their respiratory system AND their emotional wellbeing (they feel vulnerable and get anxiety from it). Birds only bang themselves against a wall when they are freaked out, otherwise, they never do. Pajarita, okay, I never knew that! Of course, I want what's best for my birds, so I will wait for their wings to grow out again and then I'll allow them to be flighted! Thanks for the information! GREAT!!!! Your birds will be much healthier and happier for it! Budgies have little voices and chatter in their words. Listen closer. You may have a talker if you have been working with them. Liz, the only way budgies learn to talk 'human' is when they are all by themselves without any other budgie around - like poor little Disco who lives with three adult humans. I disagree. Budgies can be perfectly happy alone if they are let out of the cage a lot and socialize with humans.